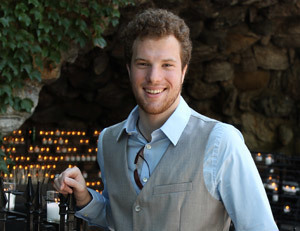 Alex Coccia, an Africana studies and peace studies major in the University of Notre Dame’s College of Arts and Letters, has been named a 2013 Truman Scholar. Established in 1975 as a “living memorial” to President Harry S. Truman, the prestigious scholarship includes $30,000 in graduate study funds, priority admission and supplemental financial aid at select institutions, leadership training, career and graduate school counseling, and internship opportunities within the federal government. A native of Columbus, Ohio, Coccia is a scholar in the Glynn Family Honors Program and an active student-athlete. He was a member of Notre Dame’s 2011 National Championship fencing team and founded the 4 to 5 Movement, a student initiative in support of LGBTQ inclusion on campus. He was recently elected student body president for the 2013-2014 term. Coccia, who is also involved in the International Scholars Program in Notre Dame’s Kellogg Institute for International Studies, taught fencing to schoolchildren in Uganda in summer 2011, and spent summer 2012 conducting research in Rwanda. He plans to draw on that research for a senior thesis on the Gacaca court system in Rwanda. Looking to the future, he said he is interested in politics and human rights law. Coccia is the fourth Notre Dame College of Arts and Letters student to be named a Truman Scholar in as many years. Past winners include Elizabeth Davis, Class of 2012, a Program of Liberal Studies major; Elizabeth Simpson, Class of ’11, a theology and peace studies major; and Puja Parikh, Class of ’11, a political science and psychology major. Among the program’s many benefits is a Truman Scholars Leadership Week, which Coccia said was a fantastic experience. “I had the opportunity to spend time with 61 other passionate and dedicated student leaders,” he said. “Their commitment to public service, whether through public office, medicine, nonprofit development work or other areas of interest, is truly inspiring. Coccia’s Truman Scholarship was made possible in part through his participation in Notre Dame’s Center for Undergraduate Scholarly Engagement (CUSE). CUSE provides undergraduate students in all the University’s colleges opportunities for research, scholarship, and creative projects. The center also assists them in finding faculty mentors, funding and venues for the publication or presentation of their work, and promotes applications to national Fellowship programs and prepares them in their application process. More information on CUSE is available online at cuse.nd.edu. Originally published by Kate Garry at al.nd.edu on June 7, 2013.